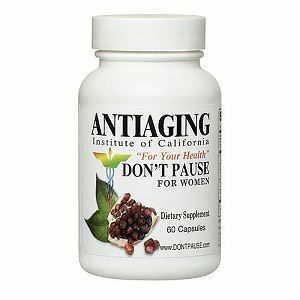 Antiaging Don’t Pause for Women supplement helps with a list of menopause symptoms such as hot flashes, cold flashes, night sweats, and irregular periods, loss of sexual desire, vaginal dryness and atrophy and mood swings. It also deals with different changes that women experience with their body such as dry skin, dry eyes, irritability and anger, weight gain, bloating and forgetfulness and other different changes. Antiaging Don’t Puase for Women also deals with pains such as headaches, pain in the bones, painful and swollen joints and muscles. The company offers different products that would “assist” also with the symptoms such as products for weight loss, skin collagen capsules and cream. Chromium – helps fight immunodeficiency and nervous system disorders. DHEA – DHEA, is a pre- hormones for both women and men. DHEA can turn to practically any important steroid hormone in the body. Green Tea – an antioxidant it helps with post menopause symptoms especially with hot flashes. The recommended dosage is one capsule for Peri menopause and two capsules, particularly one after breakfast and one after lunch for menopause. Each bottle contains 60 capsules which would last a month. They have a special offer of Buy 2 and get 1 free and a bottle costs $25.95. The product doesn’t also promise any money back guarantee. A lot of products in the market work for a lot of people and this is what you can say when you read the reviews on Don’t Pause for Women, it may not work on everyone. So in these kinds of situations, having a guarantee on your money back is very important and one of the things that customers consider these days. Jackie Horowitz	reviewed Antiaging Don’t Pause For Women	on March 17th	 and gave it a rating of 2.